As Paul and his companions travelled throughout the Roman world, they taught both Jews and Gentiles about Jesus. They would normally go to the Jews first with the message that Jesus was the Messiah. Have you ever wondered what texts Paul would have used to convince the Jews as to who Jesus was? When we preach Jesus, we normally go to the New Testament. The problem then was that in the middle of first century the New Testament had not yet been completed – the only scriptures they had were what we call the Old Testament. This is precisely where the apostles went to teach about Jesus. “After they travelled through Amphipolis and Apollonia, they came to Thessalonica, where there was a Jewish synagogue. Paul went to the Jews in the synagogue, as he customarily did, and on three Sabbath days he addressed them from the scriptures, explaining and demonstrating that the Christ had to suffer and to rise from the dead, saying, ‘This Jesus I am proclaiming to you is the Christ’” (Acts 17:1-3). Although some were convinced, others created opposition to the point that Paul and Silas needed to leave Thessalonica for their own safety. They left Thessalonica and travelled on to Berea. Again, they went to the Jewish synagogue with the same message, but this time there was a different reaction. These Jews listened and compared what Paul was teaching with the scriptures to see if what he was teaching was true. These Jews would have been very acquainted with the Old Testament scriptures. They would have been taught them from the time they were young. Paul was teaching something that would have been new to them, something they had never heard before. Rather than relying on what they thought they knew, they returned to the scriptures to investigate what Paul had proclaimed concerning the Messiah. The result was that “many of them believed, along with quite a few prominent Greek women and men” (Acts 17:12). What a great example for us. We should always be willing to open God’s word and examine the scriptures carefully to see if what is taught is what we find recorded. But do we even have a passing familiarity with God’s word so that we can check out what we hear? To many Christians, the Bible is a book which is an enigma to them because they’ve never spent time with it. So what is the solution? Like the Bereans, Christians should spend time with God’s word every day. It is only by learning God’s word that we can evaluate what we hear. It is only through learning God’s word that we can apply it to our lives so that we can be the people God wants us to be. The only way we can “grow in the grace and knowledge of our Lord and Saviour Jesus Christ” (2 Peter 3:18) is to spend time reading and studying the Bible. 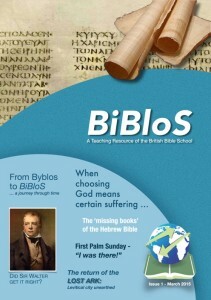 This article is from BiBloS, a teaching resource of the British Bible School. To read more articles or download the whole of Issue 1, click here.